Fresh from the garden or the Farmer's Market...whip up this great tomato sauce on a day when it's just too hot to cook! This no-cook tomato sauce is a great way to eat fresh tomatoes with your favorite pasta. We often like to cook pasta, al dente of course, and after draining simply toss it with a little Earth Balance. Then we top it with no sauce at all, just a healthy sprinkle of chopped green and red peppers, some onion, a few carrots or any other fresh, "cold" veggie you like. It's light and delicious that way. 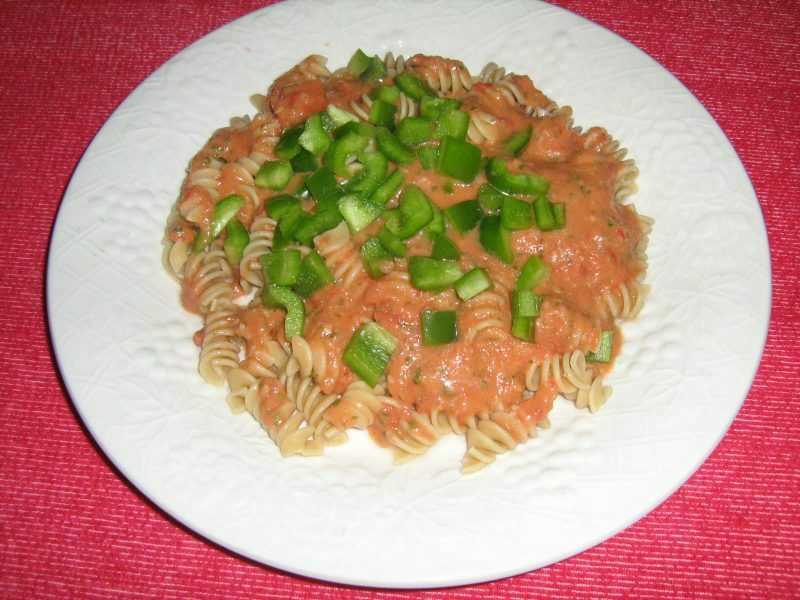 This dish is another version of pasta with a great cold topping...this time it's a sensational, tasty tomato sauce made without all the fuss and without the hot stove. Make it on a hot summer day when it's simply too hot to cook. Of course, you still need to boil the pasta and we recommend a light sauté for the garlic...but that's nothin' right? At least you won't need to cook away for hours making homemade sauce. And this tomato sauce just tastes so fresh and delicious that we think it will become one of your favorite ways to make tomato sauce...the no-cook way! for about three minutes, until tender. of tomatoes if you choose. basil leaves with stems removed, in a blender or food processor. pasta and top with a sprinkling of chopped green peppers. This sauce is delicious and tastes so fresh and raw and wonderful!